As of January 30, 2010 there are 3 available Beverly Woods East neighborhood real estate listings, ranging in price from $359,900 to $399,000. Over the past month, the level of available Beverly Woods East homes for sale has declined due to expired real estate listings and 1 additional under contract listing. 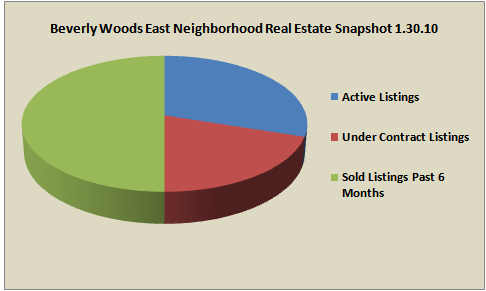 The overall supply of Beverly Woods East real estate listings is currently at 3.6 months of inventory, actually below balanced real estate market conditions. The decline in real estate supply for the Beverly Woods East neighborhood in Charlotte NC is in large part due to the drop in available homes for sale in the form of expired real estate listings that haven’t been replaced by new listings….yet. All of the available Beverly Woods East homes for sale remain are in the $350,000 to $399,999 range. The new under contract Beverly Wood East real estate listing is also in that $350,000 to $399,999 price point, and that’s an indication of movement as well as the potential for successful sales activity in the short term. 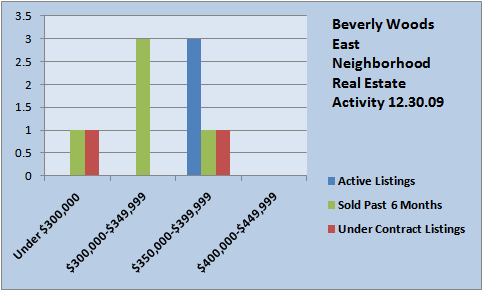 The 5 successfully sold Beverly Woods East real estate listings since late July of 2009….. The available Beverly Woods East homes for sale include 1.5 story and 2 story home styles. The Beverly Woods East neighborhood is located minutes from South Park and in the heart of South Charlotte NC. Homes were built in the 1960’s and 1970’s and home styles include ranches, 1.5 story, 2 story and tri-level single family homes. ← Winter Weather in Charlotte NC, Cause for Alarm Or A Rare Opportunity?